Mom, the Intern: Mother's Day can be hard. Mother's Day can be hard. 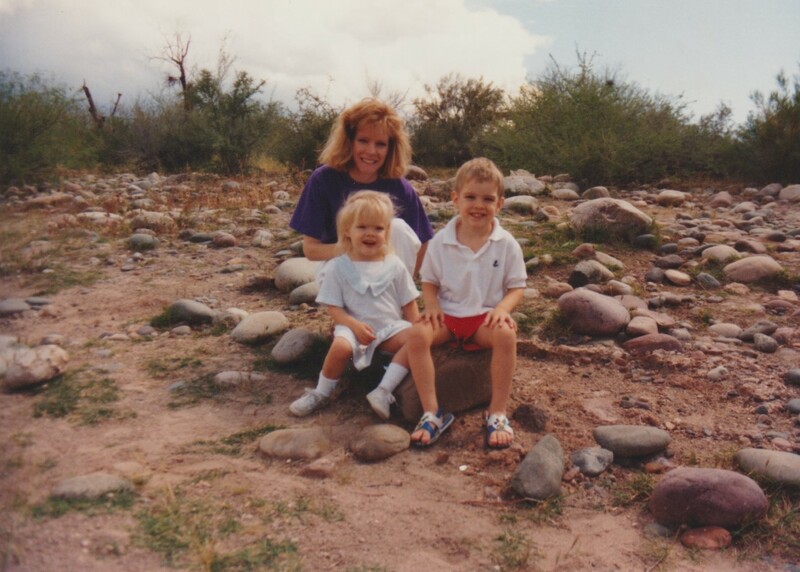 My mom with my brother Josh and me. Over a decade ago, when I first became a mother at the young age of 20, I couldn't fathom why anyone would feel pain on Mother's Day. Sure, some people struggle with their fertility, I thought, but why can't they just celebrate their own mom, or any other mother figures they know? As life went on, I met single women who longed to have a family. Women who had lost children. Women who had spent tens of thousands of dollars to get pregnant, only to come up empty-wombed again and again. Women whose mothers abandoned them or mistreated them. I began to see how the second Sunday in May could be hard for some. Then, my mom got sick and died. And last year, Mother's Day became incredibly difficult for me. It's not that I don't have other mother figures to honor. It's not that I don't appreciate my own role as a mother. It's just ... complicated. The day is filled with memories of happier times which cancer later ripped away from me. There's also an accompanying dread that I, too, could die early and leave my family behind to pick up all the pieces. And, there are those nagging reminders of my own inadequacy as a mother -- I don't spend enough time with my kids, not a good enough example to them, not as kind as I should be, not teaching them well enough ... and, the list goes on. And then, there's church. I love my church with all my heart and I love the people in my congregation. But, I've found that well-meaning church people make really insensitive comments sometimes. A common one I hear is that I shouldn't despair because I'll get to be with my mom again someday. Well, the truth is, I do have a lot of faith that I'll be reunited with my mother, and the gospel gives me so much hope. But, it doesn't make me miss her less. In fact, this idea that she's in spirit form "just around the corner" or on the other side of a thin veil actually makes me miss her more! It frustrates me that even though she's so close, I can't talk to her. I can't reach her whenever I want. Three of my mom's five children got married after she died. Was she there? In spirit -- probably. But, she couldn't help her daughters put on their wedding dresses and freshen up their makeup, she couldn't greet loved ones with big hugs in a receiving line at the reception, she couldn't fret about all the preparations with the rest of us ... none of that. It's heartbreaking. When people say, "It's so sad your mom died! But, aren't you grateful for the plan of salvation?!" Well, I am! But, I also miss my mom, especially on Mother's Day, and her death still brings me great sorrow. I CAN FEEL MANY EMOTIONS AT ONCE I AM NOT A ROBOT. It's unfortunate to me that Mormons especially seem so averse to suffering that they feel the need to annihilate it for everyone else with trite comments like this. For one thing, you can't wipe out someone's troubles with a canned statement about a gospel principle. Healing the hearts of others requires you to get down in the trenches with them, understand their pain, mourn with them, carry their burdens and comfort them. And though the sender might intend to comfort with their comments, hearing them can actually hurt the receiver quite a bit, especially on days when they may already feel sensitive. The anxiety and discomfort caused by those remarks is a big reason women like me don't want to attend church on Mother's Day. Church should be a safe, warm, judgment-free place for everyone. So, if you're prone to saying things that could be hurtful -- even if you don't intend to -- take a second to think before you speak. What you can say to someone you suspect might be struggling is, "Hey (insert name here), happy Mother's Day. I hope it hasn't been too difficult for you. I love you and appreciate you." Look them in the eye. Be sincere. Since my mom first got sick, the one thing that has always brought me comfort is the assurance that people are aware of me and care about me. Be it a simple smile or hug, a text, a call, a thoughtful gift, a treat ... any effort to reach out has given me strength and mended my heart in some way. I also appreciate when people acknowledge how sad it is that my mom's not here. It shows that they see my pain and they aren't trying to dismiss it. It also helps me process the loss. Yes, bringing it up is actually healing for me. I don't want to forget my mom, and I don't want anyone else to forget her. When I saw Coco for the first time, I sobbed pretty violently at the end -- not because it was so beautiful, but because of how tragic it is when people are forgotten in death. Hearing others talk of my mom reassures me that her memory will live on. I have heard others who have lost children or other close loved ones express the same. They cherish those tokens of remembrance that others give them. I don't think Mother's Day will ever be easy for me again. But, I do look forward to remembering my mom on that day, as well as spending time with my own precious children and reflecting on my Mother in Heaven. Just remember -- Mother's Day can be hard for some people. Give hugs and say kind words. Share a memory with them. Those are the best gifts. Thank you, Joni! Whenever I see you, I think of my mom.